Ni Hao is "How are you" in Mandarin. Here is my latest work. It took me 5 days in all to finish this wallpaper.. I only work during weekends cause I'm too busy with school... Oh well.. I used this scan found in MT and AP. patterns found at the lower part of the wallpaper are from deviantart.. scan of the cherryblossoms by kiako here. I really adore this scan, I'm happy someone used it. kinda looks weird and shapeless. skin, and just some more on the hair. Darken those flowers too, they're a very lovely addition as well. Oooo! 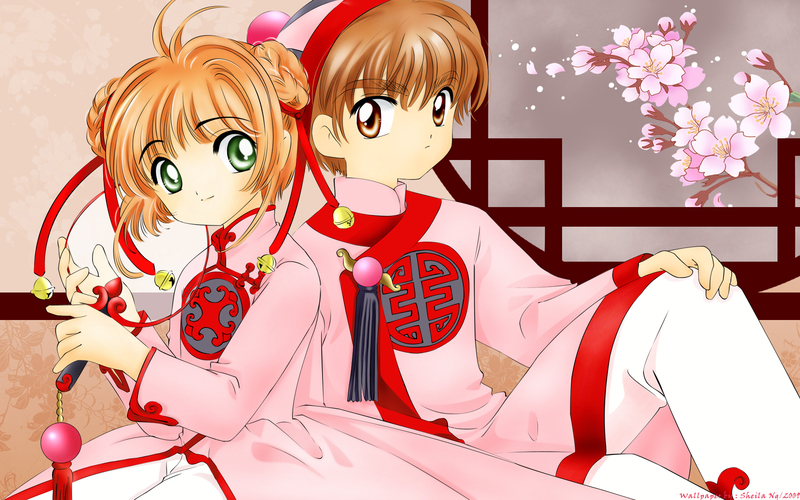 I love this wallpaper of Sakura and Syaoran. They are so cute together! Awesome work that you have done! Completely mastered! I like it a lot! Keep up the good work! Great vector and I like the way you displayed the different layers in the image as you progressed through it's creation. Very impressive. Keep it up. aaawwww... Sakura and Syaoran, they are just so cute. You did a wonderful job with this wall. Muito foda, bela imagem, valeu! So pink, so sakura. Loves the outfits.